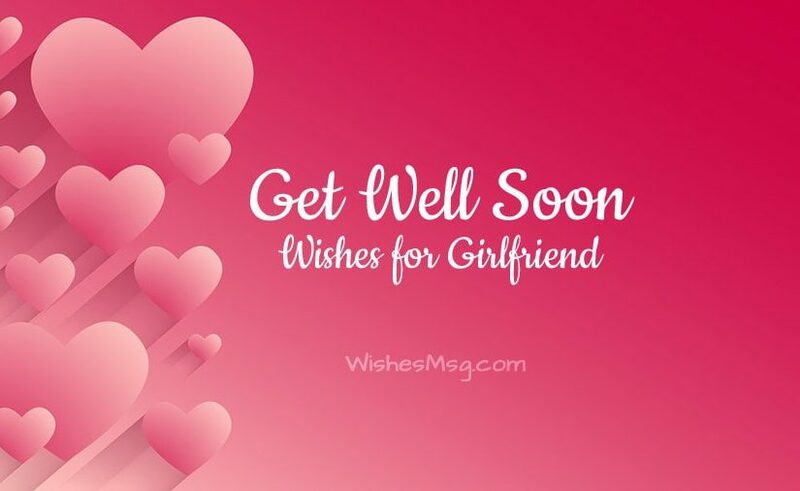 Get Well Soon Message For Girlfriend : When your sweet girlfriend has gotten sick it’s not only awful for her but also caused you so much pain. It seems life become blurry and blue without her in the short period of her illness. But keep on mind love is everything which can bring happiness and fulfillment in life. So, besides the bitter pills and medicine let your love to take care of your sweetheart girlfriend! 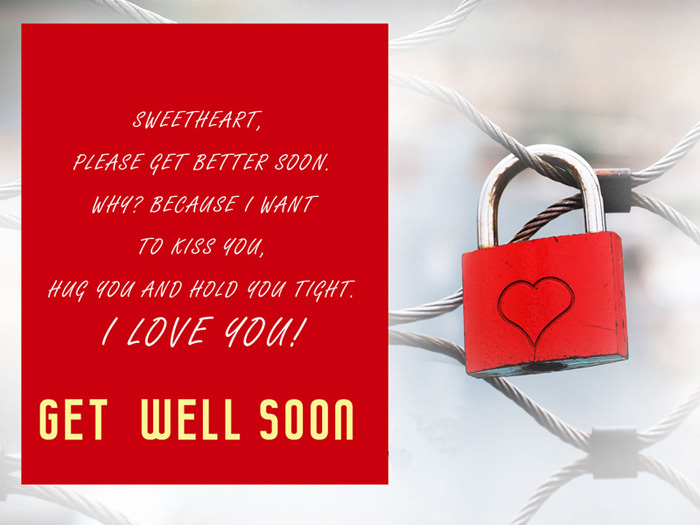 You may write to her a sweet note by wishing to get well soon or send her a Get Well Soon Message from this page which is too cute to show your care and convey your deep thoughts towards your girlfriend. Medicines will only cure your body but my love will cure your heart and soul, both. I love you. Get well soon. The pain you are feeling, I am feeling it a hundred times more. I guess that’s how people feel when they love someone so deeply. Get well soon. Before we fell for each other, we were best friends. I miss my best friend. Get well soon, baby. It breaks my heart to see you suffering. I Wish I had something magical to take away all the pains. I love you. I wish I was a doctor. It would have been easier to look after you and make you feel better. Get well soon, love. I miss your dimpled smile, I miss your cuteness, I miss your mischievousness. I miss you, sweetie. Get well soon. Bad time and good times come chasing each other. Maybe you are sick now but your good time will come too. And you will get well soon. You always told me my hugs are always warm and comfy. I really want to hug you all day to keep warm. I know your fever will go away! I remember how you took care of me when I fell sick. Now, it’s my turn to look after you. Get well soon sweetheart. I will always be close to you. No matter how sick you become, I will stick to you. Get well soon, sweetie. I miss walking with you in the middle of the road, holding your hand at night. I want you by my side always. I miss you so badly! I will be sending you truck loaded of kisses from me. I hope it works like a medicine and you get well soon. Did you see the moon, today? I want to dance with you under this moonlight. The waves of ocean and southern wind will sing for us. Get well soon. My grey life became colorful when you came into my life. Now when you are sick, the sky of my colorful life becomes cloudy and dark. Get well soon love and make my life full of sunshine. My life seems incomplete without you. Get well soon. I can’t stay without you any longer. I love you, sweetheart. My heart aches when I go for a long drive and realize you are not sitting beside me in the car. 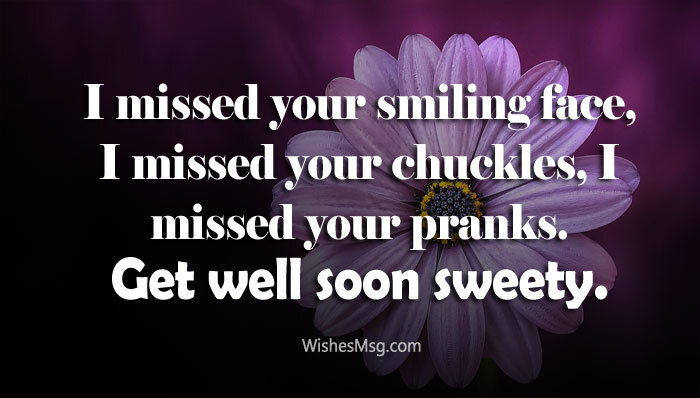 I hope that you get well soon. Even this empty seat wants you back! You look so cute even when you are sick. Right now, you are looking like a parrot with a red nose. Do you want a kiss on those pointy lips of yours? You are the cutest little spring roll when you are folded inside blankets. Get well soon cutie. I see many of those beautiful nurses are staring at me all the time. Is it because they fell for me or because they’ve never seen such a caring boyfriend? Wish I was a witch. I could have made get well soon potions for you and mix it with love potions. So that you will love me more after getting well. The girl from next door winked at me yesterday. I felt really offended. You really need to get well soon and teach her some manners first! See, that’s what happens when you don’t share ice cream with your girlfriend! Just kidding! I hope you come around soon. I miss you. I love you so much munchkin. Lay your head on my lap when you feel sick. I will be there for you. Get well soon. If I could, I would give up my life to make you feel better. Just get well soon. I know you are a strong person. You will get through anything. Get well soon, babe. Get well soon love. My blessings are always with you. Stay blessed. Get well soon, we have so much to plan. And I can’t wait to do it with you. I wish you a good health and beautiful life. Get well soon. I pray to God that he relieves you of this pain and give you back your beautiful smile. Get well soon, darling. When you are bedridden, I pray for your quick recovery and the sound mind. May God ease your pain and make your recovery quick! Dear God, you did not give me the power to heal her. It’s all are in your hand. Please, help her to heal. There is nothing in this world that cannot be cured. Dear God, you said that every disease has a cure. And I believe there is a remedy for her illness. My only prayer to God is that he gives you the strength to defeat this illness. I know he will answer my prayer with the sweetest reward of all. Dear God. You always watch over your servants. Watch over her when she is ill. Make her healthy and happy. She needs you the most. The cute smile of yours makes my heart racing. I want to feel it again. Get well soon. You are the prettiest soul I have ever met. It pains me to see you laying in the hospital bed. Get well soon. Hang in there, baby. Your personal doctor is coming. And I will make you feel better. All you need is one spoon full of kiss mixed with a dose of the hug! I won’t let you fall in love with the hospital bed. I’m already jealous. I want you to cut your ties with that bed and come back into my arms! You can beat the hell out of even the most dangerous disease on this planet. And it’s just a seasonal fever. 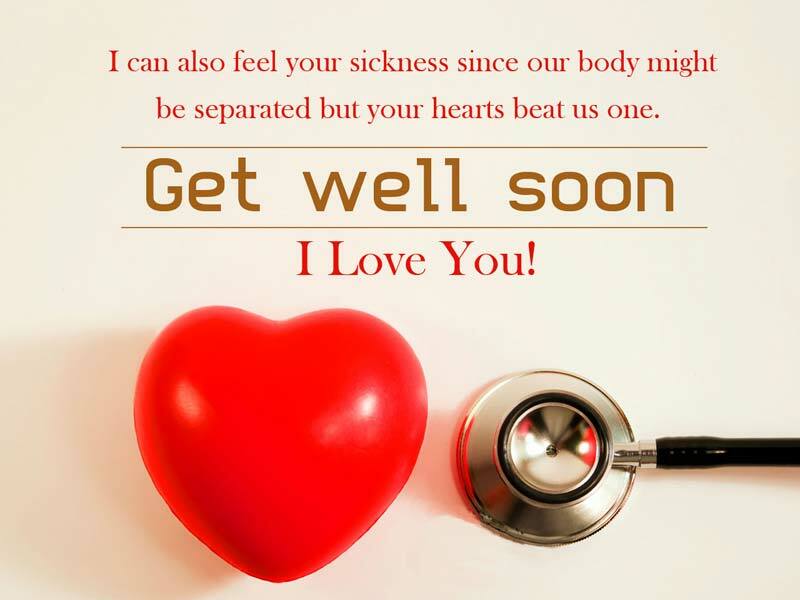 Get well dear! You will bloom just as beautiful as these flowers soon. You are not sick. Your body is just renovating itself. You will be okay and healthy. 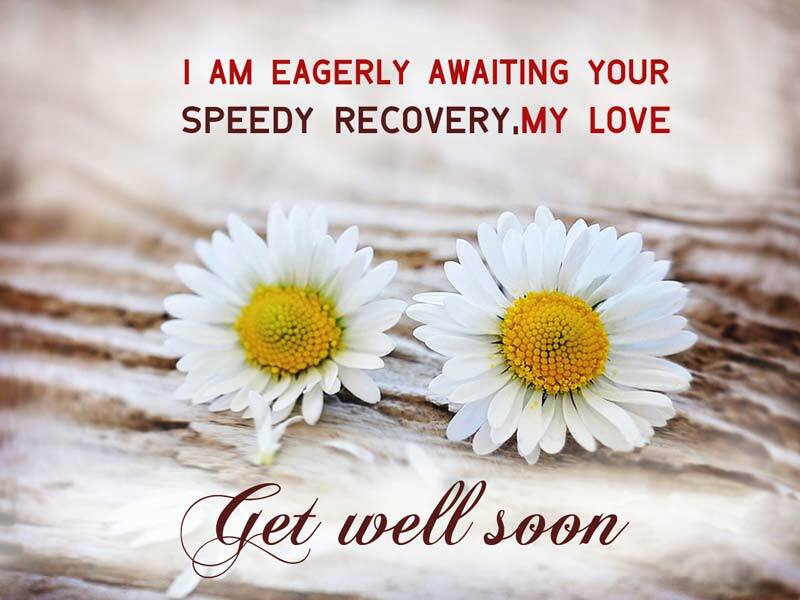 Hope you have got the clear ideas about what to write in a get well soon card message for girlfriend and by sharing these sweet get well soon wishes to her to inform that her boyfriend is waiting for a speedy recovery of his beloved girlfriend.